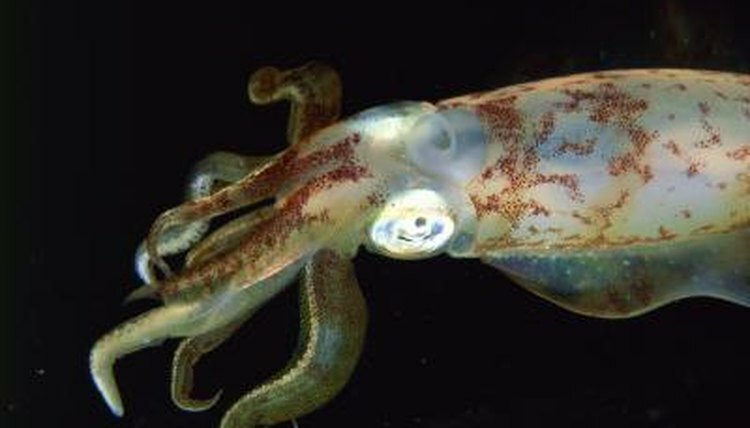 Like all living creatures, squid are classified using a system developed by Carlus Linnaeus in the 1700s. This method organizes species based on their relationships to one another into a series of broadening categories. From most broad to most specific, these categories are kingdom, phylum, class, order, family, genus and species. By examining the squid’s placement in this system, we can better understand its relationship to similar species. All squid species belong to the broad Animalia Kingdom. As the name implies, all animals belong to this kingdom. Members of this kingdom are multicellular and use other living things to supply their nourishment. Within that kingdom, squid belong to the narrower Mollusca phylum. Their phylum includes between 50,000 and 200,000 species, according to the University of California Museum of Paleontology. These soft-bodied creatures include slugs, scallops and clams. Most mollusks are distinguished from other animals by their distinctive head and foot regions. Squid belong to a class of animals known as Cephalopoda (cephalopods). This class includes the largest and most intelligent mollusks, including octopi, cuttlefish and the nautilus. The University of California Museum of Paleontology says 800 species of cephalopods have been identified. These species are distinct because of their ability to learn and to solve problems, as well as their tentacles and other adaptations to their ocean environment. Within this class, squid belong to a subdivision known as Coleoidea. Most living cephalopods also belong to this subdivision but the separation allows for differences between these organisms and similar but distinct extinct cephalopods. When some animals are more closely related to one another than others in a specific classification category, they also may be differentiated by a super- or subgroup. Squid and cuttlefish, for example, belong to a super-order known as Decapodiformes. Octopi belong to a different super-order because of differences in their gills. The order Teuthida, however, only includes squid. They are differentiated from other cephalopods not by their use of jet propulsion for movement but because of their efficiency in this area. Not only is their body designed for faster swimming but it also can adjust the amount of water expelled at a given time to increase speeds when faster swimming is required. Classifying squid becomes more difficult as the Teuthida order breaks down into more than two dozen families. At this point, each type of squid is being differentiated from every other type of squid. For example, the giant squid belongs to the family Architeuthidae while the long-finned squid belongs to the Loliginidae family. According to Sea World, more than 250 species of squids have been identified within these families.